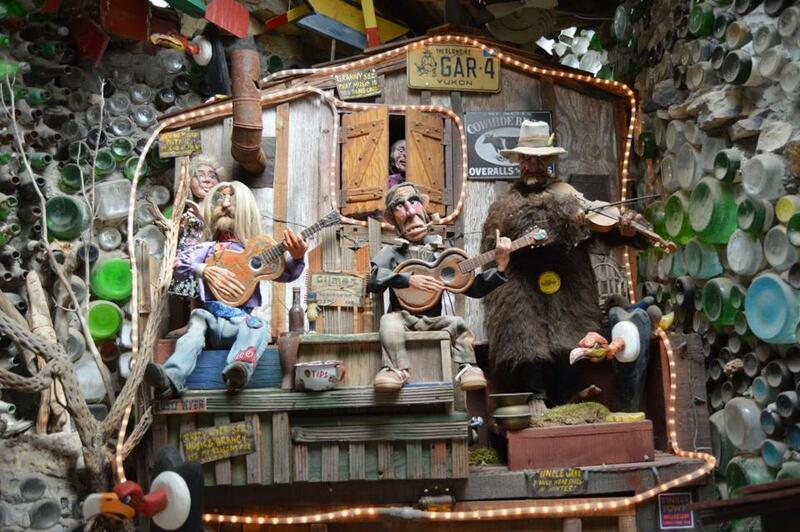 Coin-operated animatronic band at the Tinkertown Museum in Sandia Park. 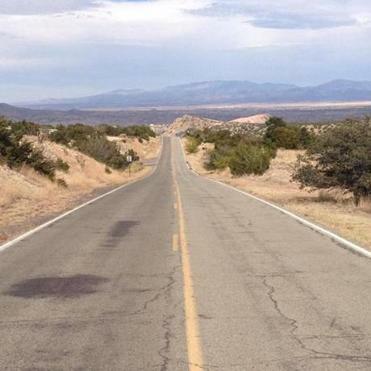 Heading from Albuquerque to Santa Fe on Highway 14, the Turquoise Trail. Blazing down Interstate 25, it takes exactly an hour to get from Albuquerque to Santa Fe. There’s nothing special about the trip beyond its brevity and proximity to gas stations and fast-food joints. Traversing the Turquoise Trail, the more scenic route, requires more time but reveals so much more about this central region of New Mexico and the folks who call it home. Its 50-some miles unfurl in slow motion through a handful of mountain towns, winding a long stretch of road dotted with piñon and juniper trees and signs that read “PASS WITH CARE” every few miles. Half an hour in, the journey takes on its own meditative magic. The eyes settle on the horizon. Suddenly, that Bob Dylan album you’ve heard a hundred times sounds even more evocative on the car stereo. Surrounded by mountains on either side, you find yourself pulling over to take pictures of the landscape that famously inspired artist Georgia O’Keeffe. In October, my partner and I took most of an afternoon to explore the Turquoise Trail’s charms. Even then it felt like we hadn’t given ourselves enough time. Here’s a travelogue of some highlights. Blink and you’ll miss this village with a population under 50. We had a memorable encounter, though. The glimmer of colored bottles dangling from a roadside fence caught our eye, only to be greeted by Leroy Gonzales, an excitable 61-year-old who told us, “Stretch your legs, man!” We got to know him real fast: After years of working hard labor, he’s now living on a pension. Oh, and he also claimed to be the mayor of Golden and pulled out a tattered business card to prove it. He was a lovable kook, the kind you hope to meet in your travels. 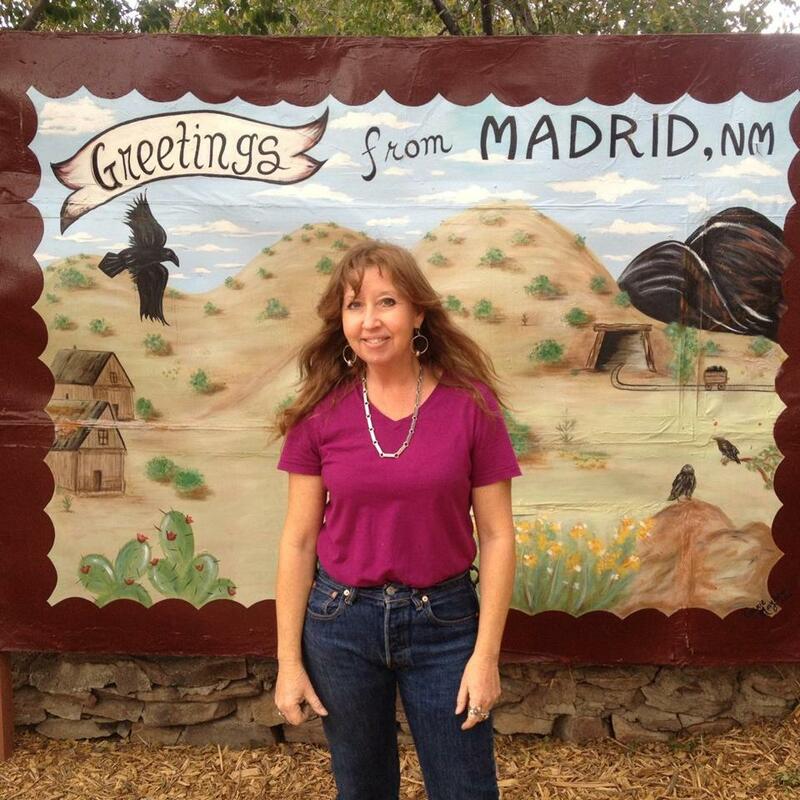 The star attraction on the Turquoise Trail, Madrid has enough bustle to warrant a “Congested Area” sign as you enter. This shabby chic little town, which the locals pronounce “MAA-drid” (unlike Spain’s capital), is full of quaint, if pricey, galleries, jewelry shops, vintage stores, and mom-and-pop restaurants. Have lunch or dinner at the Hollar, where your young tattooed waitress might tell you about how she was living in a big city but fell in love with Madrid and promptly moved here, enchanted by its laidback vibe. The menu adds a Southern accent to Southwestern cuisine: How about some fried okra with your chicken burrito? Then have a beer across the street at the Mine Shaft Tavern, a time-warped watering hole famous for its green chile hamburgers and fabled history dating to 1899. It’s full of rustic character — and characters, from cowboys in leather vests and ponytails to women dripping in denim and turquoise. Even the live band we saw was a hoot, with a lanky lead singer wearing an eye patch and wailing country-blues. The adjoining Madrid Old Coal Town Museum, which is also home to the Engine House Theatre, will give you a good rundown on the area’s backstory. Connie Mayhew owns Connie’s Photo Park in Madrid, a collection of cut-out signs you can pose with. Connie Mayhew, a Florida transplant, opened Connie’s Photo Park three years ago, and it’s hard to miss (and resist) on your way out of Madrid. Her life-size wooden signs allow you to poke your head through the holes to become everything from a rowdy cowgirl to a pair of groovy ’60s hippies. Mayhew paints all the signs, her husband drives them into the ground, and the community has donated some of her materials. Turning off Highway 14 into Cerrillos, the last major stop on the Turquoise Trail, you get the feeling this place has seen better days. It’s peaceful here, to the point you wonder where everyone is. The adobe storefronts and stately church on Main Street are beautiful but vacant and quiet. You can only imagine how they must have hummed when Cerrillos was a thriving mining destination in the late 1800s. A state park is nearby, but attractions listed on a sign as you enter turn out to be either closed or long gone. Another sign, this one chipped and fading, reads, “Thank you to the citizens of Cerrillos for your time and help. YOUNG GUNS,” a reference to the 1988 movie filmed here. After taking a few photos, we got back in the car, took a left turn, and cranked the radio. Santa Fe wasn’t far away, but it felt like another universe compared with the Turquoise Trail’s overlooked pleasures. The mountains began to shrink in the rearview mirror and, just as the road signs had instructed, we passed with care. 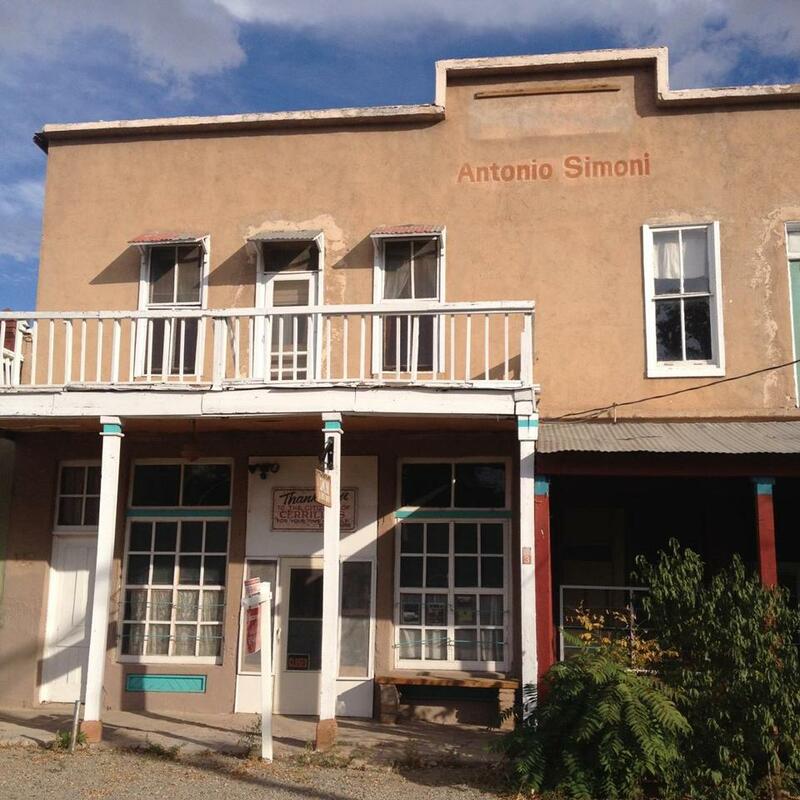 Downtown Cerrillos can resemble a quaint ghost town. Correction: Because of a reporting error, an earlier version incorrectly referred to Interstate 25.